May 29, 2001 will be a day I will never forget as long as I live. It was the day Garden State Park closed its doors forever. As you read on my intro page I worked at the track for a long time. 15 years and 1 month to be exact. I was hired on June 4th, 1985 and my last day was July 4th 2001. I stayed on for an extra month while everything in the track was auctioned off. This article is about the last day of live racing which was May 3rd, 2001. I was just over the track the other day and all the race rails are gone, the seats are gone, the winner's circle is history, as is the big tote board in the middle of the track, and grass and weeds are everywhere. It is a sad sight to see. When I began work at the track back in 1985 we used to get huge crowds, as well as have some of the finest Thoroughbred racing in the country. Spend A Buck, Snowchief pop into mind when I recall the old days. I worked in the security department and I can remember on New Jersey Derby days getting 50,000 or more people! The last few years at the track were pretty bad. Live racing dates continued to be chopped every year. We went from running a 100 live dates to the very last year running a puny 13 dates. Fewer and fewer crowds, along with management not caring about the track led to its downfall. We were getting less than a 1000 people for live racing! The final nail in the coffin was when then NJ Governor Christie Whitman vetoed a bill that would have allowed internet and phone betting. Once she vetoed the bill, I knew we were in deep trouble. I didn't even think we were gonna run a live Thoroughbred meet in 2001, but lo and behold, we ran a 13 race meet. I knew and everybody that worked at the track knew May29th was the last day of the track, so we tried to make the best of it. Here is what I can remember about May 3rd. Hope you enjoy it. I got to the track around 6:00 am. I was scheduled to work 8:00 am - 4:00 pm and my boss at the time, Ruby, had me staying till live racing was over. Our live racing card started at 3:00 pm on the last day. It was a weird feeling when I went out jogging around the track, knowing that just in a few hours it would all be over. Taking a shower in the jock's room, it didn't feel like we were closing, and I didn't want to accept it. We ran 9 live races and a small crowd over maybe under 2,000 people showed up. I did see many old employees and old friends that I hadn't seen at the track in years so that was quite fun. Now I can't remember the details of every race, but 2 races stick out in my mind. 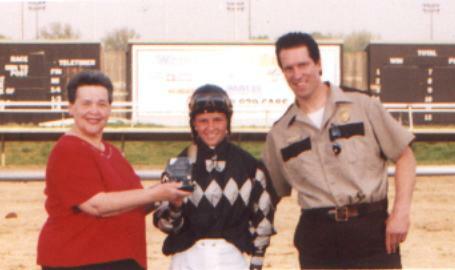 The 5th race will always have a special place in my heart due to the fact that in the 15 years while at the track, I had never gotten a chance to go into the winner's circle. Now, I was out there for the 5th race cause I had a $5 win bet on a horse. Just my dumb luck ... the horse wins! He he. Well, feeling quite happy and mighty bold, I decided I was going into the winner's circle cause after the race there was a trophy presentation! So I walked out into the winner's circle with jockey Rolanda Simpson and did the award thing. (That is the picture you see elsewhere) That was definitely a top 3 highlight for me in all the 15 years I was there. What a rush and also, since Rolanda is one of my favorite jockeys, it made it just that much more special. Also she paid $12.60 to win! He he. Rolanda also has the honor of being the last female to ever win a race at the Garden. The horse's name was "Felite Patet" in case you wanted to know. The last race ever was called "The Final Furlong." I almost cried when they loaded the horses in the gate for the final time. A 5 furlong turf race. A minute or so later as they came down the stretch, jockey Nick Santagata goes into the winner's circle with "Peg Rushton" and it was over. After a long ceremony in which all management (including me) got into the winner's circle for one final picture and that is it. I got a pic with Nick down the jock's room and then I watched everybody file out. I still couldn't believe it was over, but it was. Working at Garden State was a wonderful experience and I wouldn't trade it for the world. For the record, the last jockey every to cross the finish line is Laure Freeman. Some people I would like to thank for all the good times at the track include: Capt. Callaway, Winnie Wolenter, Robun Cucinatta (thanks for putting me down the jocks room you rule), Ruby Pond (also for putting me down the jocks's room), Roger Buck, Eric (just checking) Zuber, Ray Mullin, Joe Corcoran (the best boss) and the following jockey's for all the great times down the jock's room: Rolanda "Roly" Simpson, Charleen "Hang Loose" Hunt, Deidre Panas, Felix Ortiz, Sunday Diaz, Janice Blake, Nick Santagada, and an extra special thanks to Lisa Dellipaoli. Garden State RIP April 1st, 1985 -- May 29th, 2001. Thanks for joining us, and we'll see you at the races.